Iron deficiency is one of the most common nutritional concerns after bariatric surgery. Estimates indicate that up to 50% of bariatric surgery patients experience iron deficiency due to a number of factors that may include reduced absorption of iron and a decreased intake of meat. 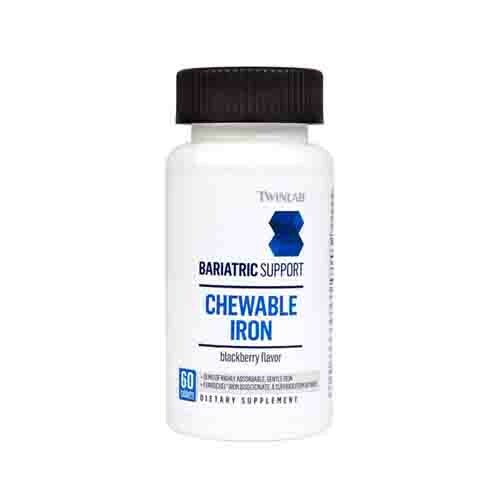 Twinlab Bariatric Support Chewable Iron is a highly absorbable iron supplement formulated to help bariatric surgery patients meet their daily iron requirements in a tasty and convenient chewable tablet. This product contains Ferrochel iron bisglycinate, a unique form of chelated iron formulated for maximum absorption without gastrointestinal irritation or the constipating effects that often accompany iron supplementation. Studies have shown that Ferrochel is both better tolerated and more readily adsorbed than ferrous sulfate - which is found in some other iron containing supplements - making it an ideal iron form for bariatric surgery patients. Use in accordance with your physician's recommendations. Typical use: Chew one tablet daily, preferably between meals or on an empty stomach. If you are pregnant or nursing, taking any medication or have any medical condition, consult a health care professional before use. ACCIDENTAL OVERDOSE OF IRON-CONTAINING PRODUCTS IS A LEADING CAUSE OF FATAL POISONING IN CHILDREN UNDER 6. KEEP THIS PRODUCT OUT OF REACH OF CHILDREN. IN CASE OF ACCIDENTAL OVERDOSE, CALL A DOCTOR OR POISON CONTROL CENTER IMMEDIATELY.